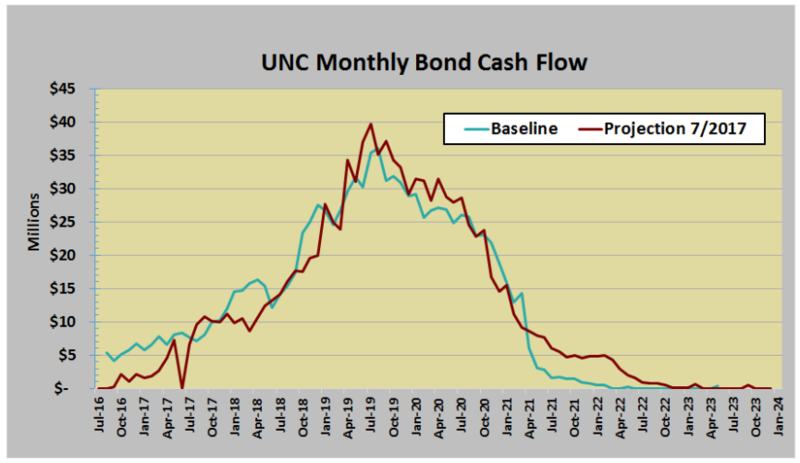 Raleigh, N.C. – The $2 billion ConnectNC bond approved by the state General Assembly and voters in 2016 is rapidly increasing cash flow to University of North Carolina (UNC) system campuses, allocating $10 million a month in January and peaking at $40 million a month by 2019. The higher education bond invests $1.065 billion in 21 new science, technology, engineering and math (STEM) capital projects across the UNC system, like a $70 million health sciences building at Appalachian State University (pictured). It also allocates $350 million to the North Carolina Community College System (NCCCS) for new construction, repairs and renovations of workforce training facilities totaling 65 capital projects. The ConnectNC bond was approved by the state legislature to strengthen North Carolina’s global economic impact in scientific research, healthcare, biotechnology and other STEM-related fields. The cutting-edge facilities are part of the General Assembly’s long-term vision for accelerating job creation and competitiveness with state-of-the-art workforce training for modern manufacturing industries. 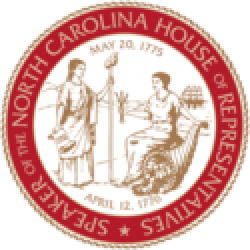 “STEM programs in the UNC and community college systems are a powerful driver of economic success in North Carolina,” said state House Speaker Tim Moore (R-Cleveland), a former member of the UNC Board of Governors. The bond’s major investments include a $90 million engineering building at North Carolina A&T State University, a $50 million science building at Winston-Salem State University and a $110 million science building at Western Carolina University, to name a few. 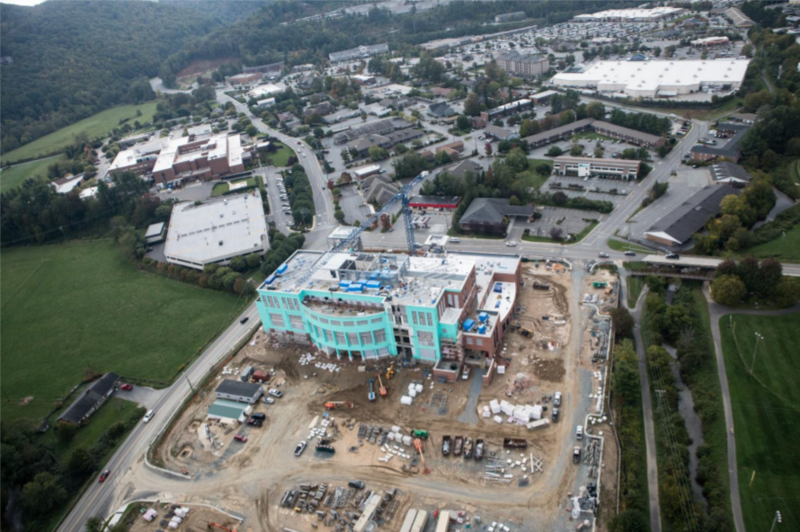 The UNC System, comprised of 16 universities and the North Carolina School of Math and Science, is slated to complete a total of 21 ConnectNC projects by 2022. Each of the 11 new STEM buildings for university campuses were the number one capital project priority at their institution, according to the UNC system. While only two projects are currently in the construction phase, most are expected to begin construction by 2019. Those expenditures will rapidly increase in 2018 and 2019 as bids are completed, designs are implemented, and construction begins on the projects to offer new opportunities for STEM students at universities and community colleges in North Carolina. “North Carolina’s vibrant economy and growing demand for STEM-related careers make these investments in higher education critical to our state’s success,” Moore said. 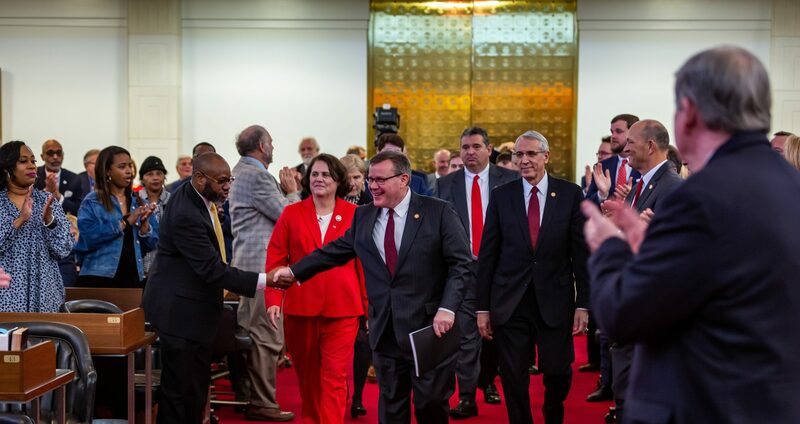 With a record $1.8 billion rainy day reserve, responsible spending and growing tax base under Republican leadership, voters agreed with the General Assembly by a 2-1 margin that North Carolina was in in sound fiscal condition to finance capital projects with the ConnectNC bond. 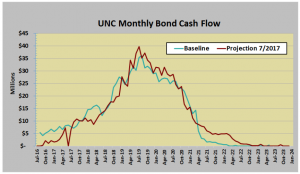 The state’s estimated debt service schedule on the ConnectNC bond is expected to remain below a projected rate of 3.75% through 2025, according to the North Carolina Office of State Budget and Management (OSBM). The first ConnectNC bond sale was for $200 million in August 2016 at an interest rate of 2.079%. The state issues bond sales based on the cash flow needs of the projects being financed. “Our ConnectNC investment empowers universities to modernize and expand STEM facilities, retaining a competitive advantage with superior classrooms and hands-on education opportunities,” Moore continued. $50 million science building at Winston-Salem State Univ. $90 million engineering building at North Carolina A&T State Univ. $10.6 million renovation of science building at Fayetteville St. Univ. $30 million business school at N.C. Central Univ. $90 million biotechnology building at East Carolina Univ. $70 million health sciences building at Appalachian State Univ. $110 million science building at Western Carolina Univ. $13 million facilities renovation at Elizabeth City State Univ. $160 million agriculture and engineering building at N.C. State Univ. Learn more about the construction costs, cash flow, and impact of the ConnectNC education bond from the Joint Legislative Oversight Committee on Capital Improvements in the North Carolina General Assembly.